In my house Thanksgiving is all about family and food. And as I’ve mentioned before, Zelda has really taken a liking to helping me out whenever I’m in the kitchen. She has become a master stirrer, taster and sprinkler. With her willingness to still eat vegetables without bribery (I’m sure my days are numbered) I wanted to think of a creative way to work veggies into our spread this year, and viola! Cranberry and bacon Brussels sprouts were born. What are your go-to Thanksgiving side dishes? I wanted to think of a creative way to work veggies into our spread this year, and viola! Cranberry and bacon Brussels sprouts were born. Heat the olive oil in a skillet over medium heat. Add the cut and halved Brussels sprouts and brush with more olive oil and add the minced garlic; sprinkle with salt and pepper and cook for 10-12 minutes, flipping the Brussels spouts occasionally and adding more olive oil as needed. Once the sprouts have been in the skillet for 10-12 minutes add the cranberries and place a lid over the skillet. Allow them to cook for 2-4 minutes; checking them every so often, you don't want them to burst. 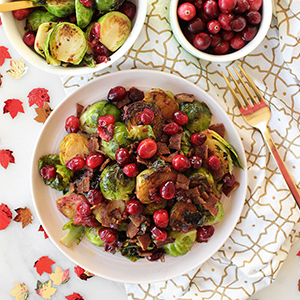 Once cooked, place the cranberries and Brussels sprouts in a bowl and toss with the cooked and diced bacon.